What if I told you I knew of a magic vegetable? A vegetable high in beta carotene, calcium, phosphorus, magnesium, vitamin A, and potassium. A vegetable that could be popped in the oven for an hour, cut open, and devoured immediately. What if I told you this vegetable is basically pasta? Filling, hearty, soothing and delicious. Friends, meet the spaghetti squash. I had no idea this vegetable existed until a family dinner at Ruby Tuesday. I ordered the side of Roasted Spaghetti Squash, topped with marinara sauce. Little did I know I was in for a scrumptious bowl of noodle-like vegetable. Could it be that this seemingly rich treat was low calorie, low cost, and has no carbs? Oh, happy day! Fortunately, spaghetti squash is incredibly easy to prepare. Simply pierce the football-sized vegetable with a knife, place it in the oven on a baking sheet at 400°, and roast for an hour. Then cut in half lengthwise, scoop out the seeds and fibers. If you’re super hungry you can just eat the strands of squash out of the shell with a fork. Or you can use your manners and put the “noodles” in a big bowl and share with friends, as you would for pasta. I don’t mind eating this tasty treat all on its own, but here’s a simple and satisfying way to enjoy this vegetable. Preheat the oven to 400°. Pierce the spaghetti squash with a knife, and place it in the oven on a baking sheet for 1 hour. Meanwhile, heat the olive oil in a small saucepan over medium heat. Add garlic and cook until aromatic, about a minute. Stir in spices, salt, raisins, and chickpeas, and remove from heat. Cut the squash in half, scoop out the seeds and fiber. Pull out “noodles” with a fork. 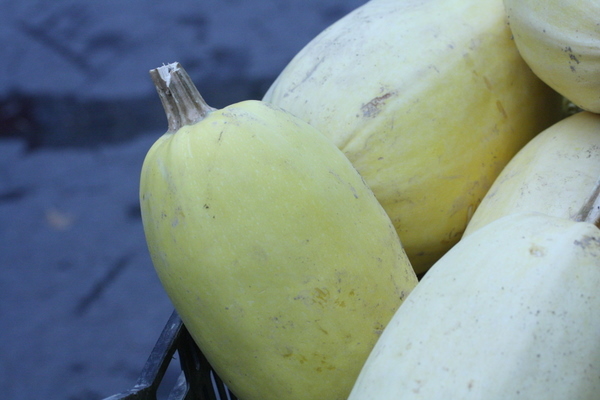 Mix spaghetti squash with the spiced oil mixture. Enjoy! Try adding… roasted garlic, butter, or fresh basil! Suzannah Schneider is a junior at Tulane University and is making great use of her first real kitchen. She enjoys trying new vegetables, cooking for friends, and eating vegan cookie batter by the spoonful. Categories: Blog, Campus Cooking, Eating, Featured, Healthy Recipes, and Recipes. Cooking Method: In the Oven and On the Stove. I Don't Have Any: Money and Space. I'm Cooking For...: Easy Dinner and Myself. Type of Food: Sides, Vegetarian, and Vegetarian Main. I Don't Eat: Any Animal Products, Dairy, and Gluten. This sounds amazing! And perfect for the limits of a communal dorm kitchen! Definitely going to try this! I am going to try this! i have been looking for this vegetable does anyone have any seeds so i can grow it please? I love spaghetti squash served with chickpeas, tomatoes, kale, garlic and olive oil. If I don’t have any canned or fresh tomatoes I substitute with spaghetti sauce. So good and yummy.. I eat kale all year round and toss it in a ton of recipes. I’m not vegan but I eat a mostly plant based diet. I have a distinct weakness for fried chicken though…. This makes it even more difficult to access electrical outlets easily. Just go online and visit . Not only leather but also fabric chesterfield sofas are in huge demand. with the most powerful components that are available on the market. Not surprisingly, the laptop computers or notebooks, as they say it, are much more expensive than their bulky counterparts. computer system much tougher to breach. burnt up, yet everything around him was torched. in the latest check scanner systems from the industry’s top manufacturers. This fits right into my plant based diet and it doesn’t hurt that I love spaghetti squash and chickpeas. And a note to all, this squash is pretty pricey as most stores sell it by weight, and it is heavy. However, they are incredibly easy to grow. I could not believe how easy they are to grow, they need heavy watering, good soil, and viola, you can have spaghetti squash forever. It freezes well too!! The part can http://www.zebrabusinesscards.com/designs/cupcake_bakery_zebra_print_pink_elegant_modern_double_sided_standard_business_cards_pack_of_100_240213032667316804.html never be well unless the whole is well. Awesome post. Thanks for sharing this wonderful post with us!